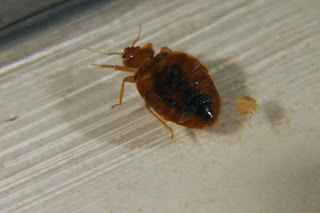 Bed bugs are small insects that feed on the blood of mammals and birds. They are sometimes referred as "red coats", "chinches" or "mahogany flats". They are usually active at night but when they are hungry they feed during the daytime. They usually populate human dwellings, birds nests or bat caves since this offers warmth a place to hide and a host to feed on. They usually populate human dwelling especially if it is crowded. They live in cracks, crevices in walls, furniture, behind wood paneling, behind wallpaper or under carpeting. They can be transferred from one place to another via clothing, luggage, bedding and furniture. They do not have the means to cling to hair, fur or feathers and are rarely found in hosts. Bed Bugs do not carry any danger to man,it is basically a nuisance. They usually work at night when you are sleeping and the bite is painless. Most people do not react to them but there are a few individuals who will be allergic to their saliva resulting in welts, itching and swelling. The typical lifespan is 10 months and can survive for weeks without feeding. How to get rid of "BED BUGS?" They are one of the most difficult things to treat because they can hide very well. If all fails call the pest control guy.